BOO! BOO! BOO! BOO! BOO! BOO! BOO! BOO! 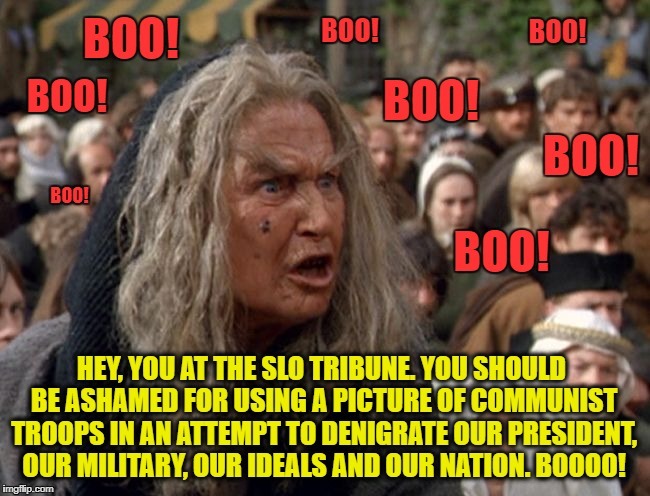 HEY, YOU AT THE SLO TRIBUNE. YOU SHOULD BE ASHAMED FOR USING A PICTURE OF COMMUNIST TROOPS IN AN ATTEMPT TO DENIGRATE OUR PRESIDENT, OUR MILITARY, OUR IDEALS AND OUR NATION. BOOOO!